﻿ ﻿Landscape equipment is an integral part of any fleet. Your tools are how your employees make their livelihood. Taking care of your equipment will increase its usefulness and time before you have to replace it. Taking proper care of landscape equipment in the winter is especially important because winter weather can certainly take a toll on it. 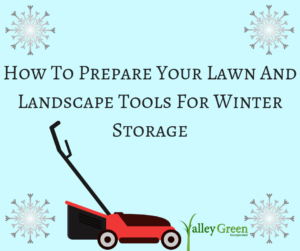 Today we’re going to talk about how to prepare your lawn and landscape tools for winter storage. Rinse and thoroughly dry all of your small landscaping tools. Clean the mud and dirt off of them with a stiff brush and remove small patches of rust with a piece of sandpaper. You should also have their blades sharpened so that they are ready to go in springtime. Gas powered trimmers should have their gas drained and string heads cleaned as well as installing a new line. Mowers should be emptied of gas and their blades should be sharpened and cleaned. You should replace the air filter as well. Try to store the mower away from all corrosive chemicals in case of a spillage accident. You’ll want to make sure you clean your sprayers inside and out with warm soapy water. Rinse thoroughly to make sure all the soap is out of the lines. All tools that are longer such as shovels and rakes should be stored in an upright hanging position off the ground. Check our leaf blowers and clean the dirt off of them. Clean the vents and wipe out any debris that may have accumulated. You should also clean your wheelbarrows of dirt and debris. Touch up paint chips so no rust settles in over winter. These tips will help your fleet in having a successful and quick start to spring work. Valley Green was founded by Charles Dooley in 1990. Headquartered in Holyoke, Massachusetts, we have grown to eight branch locations supported by inside & outside sales associates specializing in turf seed, sod production, golf sales, turf maintenance, nursery production, agriculture and arboriculture. The average green industry tenure at Valley Green is well over 20 years per associate!